NES Remix 2, like NES Remix before it, is a game that takes players back to the glory days before the hype trains, before Nintendo Direct, before my body is ready. Unfortunately, NES Remix 2 also snaps you out of it with some deeply irritating bugs and imprecise controls. 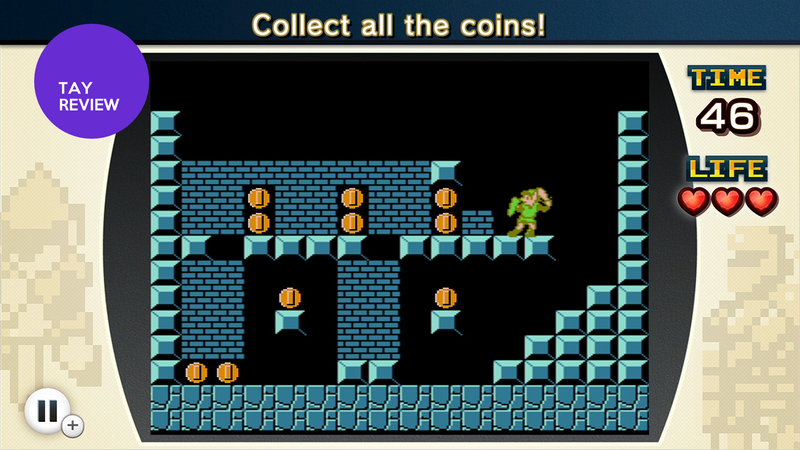 NES Remix 2 brings something for everyone to the party. With a lineup that includes Punch Out, both the Japanese and US versions of Super Mario Bros. 2, Super Mario Bros. 3, Kid Icarus and Link's Adventure. The only really confusing selection is Wario's Woods; one of the NES' final games, and one that wasn't particularly fun to boot. Aside from that, the games on offer are stellar, and make for fun minigames. Forget achievements, Nintendo's approach with with NES Remix 2 will send you back to challenges time and again to try to top their scores. Not only can you see Miiverse posts from your friends (and strangers, though friends' posts are prioritized) but you can also view their run through the stage. I hope Nintendo takes a similar approach with future games. The best challenges in NES Remix 2 are easily those that place a character into a foreign franchise. Collecting coins as Link or Pit or killing Octoroks as Toad just feels great. These challenges are too few and far between, and could easily make an amazing game on their own, something akin to an official version of the popular web game, Super Mario Crossover. I'm glad Nintendo is continuing what they started in Super Mario 3D World here. Miiverse is full of art, which is great, and stamps help fill a void for those of us (definitely me) who can't draw to save their lives. Not to mention having access to old Nintendo pixel art is just awesome, no matter how well you can draw. It's hard not to like Super Luigi Bros. as a free add-on to another game. If you liked the original Super Mario Bros., you'll like this. However, I really would have liked to see something more from this. Playing a backwards SMB with a slippery main character is fun and all, but it feels like Nintendo just made a 8-bit demake of New Super Luigi U. As I mentioned before, I'd much rather see something of a crossover in Super Luigi's place. Throughout the course of my time with NES Remix 2, I noticed more technical issues than I think I've ever seen in a Nintendo game. It was immensely frustrating to find Luigi running in mid-air, Mario standing on a coin, or Kirby slowed to a standstill. In 2014 and on the Wii U, I would expect NES titles to run perfectly, not just because it's ridiculous for them not to, but because they also run perfectly if you buy these same titles on the virtual console. Metroid, Super Mario Bros. 3 and Kirby's Adventure seem to fare the worst out of the group, with the majority of the other games running well. At the end of the day, NES Remix 2 is a fun, addictive collection of microgames based on beloved franchises, even in spite of its flaws. The games included serve as a fantastic reminder why so many of us still love The House that Mario Built to this day. For some, however, the slowdown and bugs, combined with sometimes unresponsive controls will leave them disappointed. UPDATE 4/30/14 8:42 AM: As some readers pointed out, many of the glitches I perceived were not unique to NES Remix 2, and were actually present in their original iterations. I apologize for the error and have updated my rating of the game as a result.